Our Custom Printed Table Runners and Table Cloths with your logo or brand image adds a beautiful accent to an existing covered table. A great affordable way to make a good impression with a custom business display at your next trade show, business expo or special event. 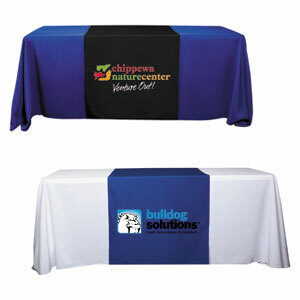 Use trade show table runners with a custom printed table throw for business events to set your brand apart. They are 84" long. They drape over the front, across the top and down the backside of the table. Made from 100% wrinkle resistant premium weight polyester fabric. (No ironing or dry cleaning required, machine washable). Hemmed finished edges prevent fraying. Perfect for 4ft, 6ft and 8ft tables. Backside runner drapes all the way down.